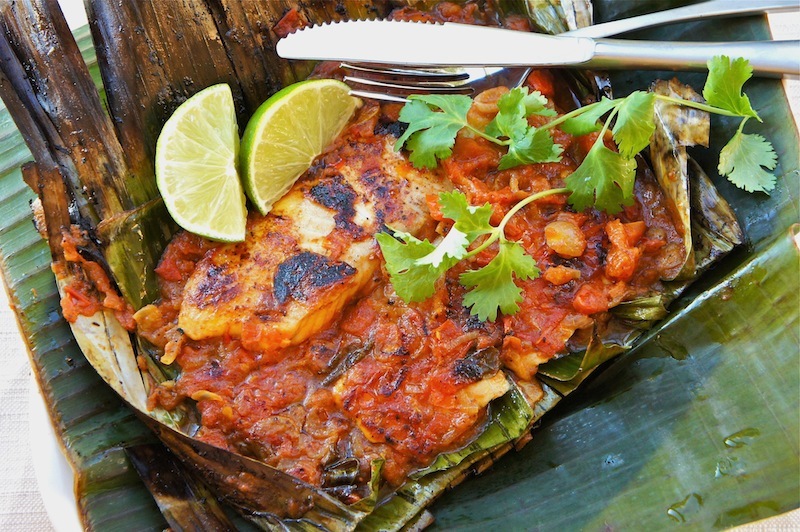 This is one of my favorite fish dish, a simply delicious Grilled Fish In Banana Leaves recipe. It’s recommended that you use fresh Tilapia fillets and spice it up with the aromatic flavors of shallots, garlic, ginger, garam masala, chili powder, curry leaves, diced tomatoes, and lime juice. Wrap all the ingredients using some banana leaves and grill in a lightly oiled frying pan. The fish tastes really good, spicy, moist, and with a lovely aroma from the banana leaf. Yummy! Cook the shallots, garlic, ginger, and curry leaves with the peanut oil on moderate heat until aromatic. Mix in the chopped tomatoes, sauté and add garam masala, chili powder, turmeric, lime juice and season with sea salt. Lower the heat and simmer the spice mixture for about 10 minutes. Divide the spice mixture into 2 portions. Grease the banana leaf and place some spice mixture in the centre. Place the fish over the spice mixture and top with rest of the spice mixture. Wrap the fish in the banana leaf and secured with kitchen strings if necessary. Heat a large frying pan over high heat. Add about 2 Tbsp of oil and place the wrap fish and grill for about 5 to 6 minutes on each side. Serve immediately with lime wedges, coriander and steamed rice, if desired. This fish look amazing, and so healthy! I wish I had easy access to banana leaves... 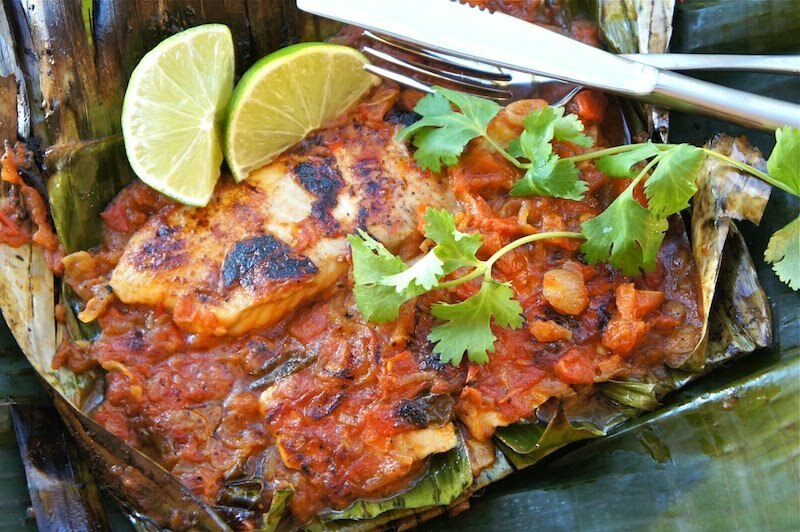 I'd love to try this fish, and all those other recipes that use banana leaves. I just recently got a bamboo steamer so it would come in handy with that too. this grilled fish looks delicious, I love grilled food with banana leaves. wrong time to step into your blog again!! Why!!! I LOVE LOVE LOVE ikan Bakar, and I was just thinking of it 5 mins ago.. Absolutely delicious and you even grilled it with banana leaves! So yummy with some rice as well. oh, wow, that looks swallow-your-tongue GOOD!! The grilled fish in banana leaves looks so delicious. I love the combination of ingredients in your recipe. Now all I have to do is track down some banana leaves. Are they available in most Asian food stores? @Anna's Table: Yes, they are available at the frozen section in most Asian grocers.